This week, the leaders of North America’s electricity industry will gather under one roof, as they have for the past 51 years, at the Edison Electric Institute’s annual financial conference. This once-a-year event gives analysts and investors an opportunity to talk to CEOs and CFOs from the power sector about emerging trends and where they plan to take their companies. Talking face to face with industry executives and institutional investors provides a wealth of intelligence that goes beyond what you can uncover by poring over financial results, listening to quarterly earnings calls and talking to representatives from investor relations. That’s not to diminish the value of these activities, all of which are critical to identifying the best investment opportunities and being able to ask management teams the right questions. In this regard, the timing of the Edison Electric Institute’s financial conference couldn’t be better; many of the more than 200 essential-service companies we track at Conrad’s Utility Investor have reported third-quarter results. I spent much of the past week reading earnings releases, listening to conference calls and updating my comments, ratings and proprietary Quality Grades for these stocks in the publication’s Utility Report Card. The results of this rigor speak for themselves: My top picks from last year’s conference have generated an average total return of more than 35 percent—more than two times the total return posted by the Dow Jones Utility Average over the same period. What’s my preparation for the Edison Electric Institute’s financial conference telling me this time around? First off, US electric utilities generally have posted solid quarterly results, which hardly comes as a surprise when you consider that the industry has reduced financial and operational risks systematically since Enron imploded 15 years ago. Utilities have also discovered that they can grow their earnings by investing in ways to deliver electricity more efficiently while cutting carbon dioxide emissions. Power companies that depended heavily on coal-fired power plants continue to invest billions in facilities that burn natural gas as well as smart-grid technologies, battery storage and distributed solar power. All these investments expand their rate base, driving earnings and dividend growth. This transition and its ramifications were on full display last year. That SunPower Corp (NSDQ: SPWR), a leading manufacturer of solar-power components and systems, sponsored the 2015 conference underscores the appeal of collaborating with utilities instead of pushing distributed solutions. Our exclusive report from last year’s conference highlighted SunPower’s sponsorship of the event as an acknowledgment that the balance of power in solar energy had shifted from the likes of money-losing SolarCity Corp (NSDQ: SCTY) to regulated utilities. This intelligence prompted us to warn Conrad’s Utility Investor subscribers to avoid SunPower and First Solar Corp (NSDQ: FSLR), both of which have taken a hit from intensifying price competition among component manufacturers and customers holding back on orders in anticipation of further downside in prices. At the same time, the emergence of solar power as a growth catalyst prompted us to increase our buy targets for utility stocks with leverage to this trend—a winning strategy that contributed to our picks’ strong performance after last year’s conference. Heading into the Edison Electric Institute’s financial conference, solar power figures prominently on my agenda for this year. The past year brought a wave of mergers and acquisitions involving electric utilities, though deal flow has slowed considerably since the summer. However, several large transactions have yet to close; the Edison Electric Institute’s financial conference gives us an opportunity to check in on the companies involved in these deals. At last year’s conference, the answers we got from NextEra Energy (NYSE: NEE) and Hawaiian Electric Industries’ (NYSE: HE) regarding their pending tie-up reaffirmed our decision to take the money after the deal was announced. Hawaiian Electric Industries was also one of our five pans from the conference, in part because of concerns that the deal could fall through. 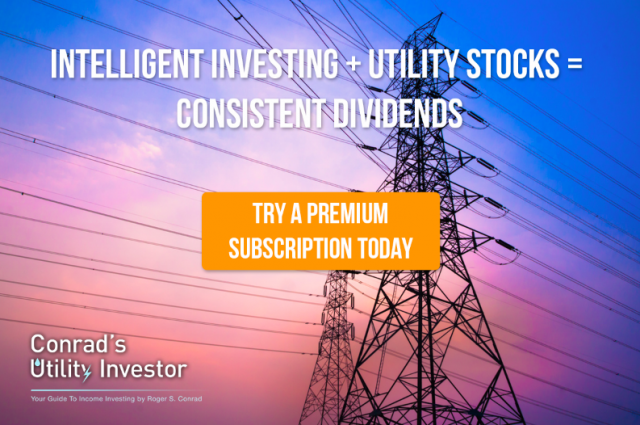 Although all our best investment ideas from last year’s conference delivered solid total returns, our more than 60 percent gain in deep-value pick Talen Energy Corp (NYSE: TLN) came from a takeover offer from the private-equity outfits that took the firm public in the first place. We’ll keep an eye out for other deep-value opportunities at this year’s conference and keep an ear to the ground for names that private-equity investors might be stalking. Of course, the key is identifying dirt-cheap names that we don’t mind holding if a deal never materializes—many beaten-down stocks are cheap for a reason. At the other end of the spectrum, best-in-class utility stocks continue to trade at historically elevated valuations, even though the Dow Jones Utility Average has pulled back by roughly 10 percent from its July high. Utility stocks have benefited, in part, from investors rotating into the sector amid expectations that the group will outperform as long as the Federal Reserve keeps interest rates lower for longer. Meanwhile, 15 years of strengthening balance sheets and shedding operating risk have made regulated utilities a top defensive holding for anxious investors. The uptick in mergers and acquisitions also creates opportunities for significant capital gains—if you pick the right names. But historically elevated valuations raise the bar of expectations, creating a situation where traders will latch onto any sign of weakness to take profits. Against this backdrop, the bet against utility stocks that we added to our model Portfolio in July has generated a solid profit thus far—and we could be in store for more upside. In this environment, remaining patient and adhering to our value-based buy targets become even more important. As always, we’ll keep an open mind to avoid filtering out any unexpected investment opportunities. Attendance at the event can also provide important insights into investor sentiment. At last year’s conference, the lack of long lines at the coffee pots suggested that the sector wasn’t high on many portfolio managers’ shopping lists, setting the stage for outperformance. Which presentations will garner the biggest crowds and which will attract the smallest audiences? Will most of the institutional investors come from the bond side, like last year? What key words will figure prominently in executives’ presentations? What themes will emerge during Q-and-A sessions? I can’t wait to find out and share my takeaways and best investment ideas from the conference with Conrad’s Utility Investor subscribers!